If you have a low contrast between the link-color and the background-color (white on light-green, like in the image shown above), apply a light text-shadow to your navigation links. Note: This effect is only visible in Firefox 3.5+, Safari 3+, Opera 9+ and Chrome. Change the color for an :hover effect, or like I did in the navigation, apply a darker and slightly bigger text-shadow to the link. With the following CSS applied, the link has a light 3D effect, like hovering over the navigation. If it’s a link, let the link show some reaction. Use a:active to apply a small button-style effekt to your links. As a result to the code shown below, your link will “jump” 1px below its current position. If image 4 + 5 looks the same to you — well, that’s by intention. The 1st page, right after you clicked the link, but before the 2nd page loads. The 2nd page after the click. I use the same color for a:focus and a.current (whereas .current is the class applied to the current page link on the 2nd page. I also used it to create a seamless transition between the 1st and the 2nd page. Note, it’s only useful if you know, that the now current link on the 2nd page is at the same position like the a:focus on the 1st page, e.g. the navigation above. Also note, if it’s not obvious that the new page loaded, because of a very big header using the browsers complete viewport, this effect can be confusing. It can also be confusing if your page loads very fast or very slow. If you haven’t seen a lot of changes in the images above, open my website with either Firefox 3.5, Safari 4, Chrome 2 or Opera 9+ and check the top navigation above. Thanks to Korsti and Björn. 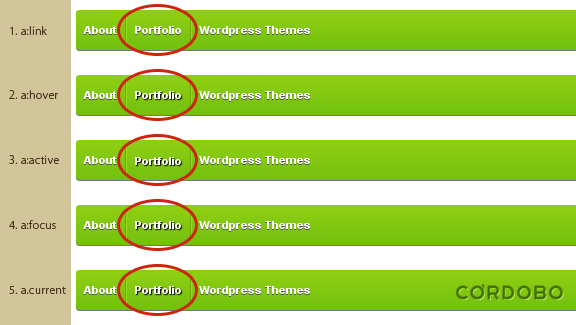 Backup your customized version of the cordobo green park 2 theme and upload the unchanged files of the original theme to your server and activate this theme. If this works and the search field will be shwon, you should check your customized theme. where do I have to do this editing? Nowhere ;) It’s implemented in my theme Green Park 2.